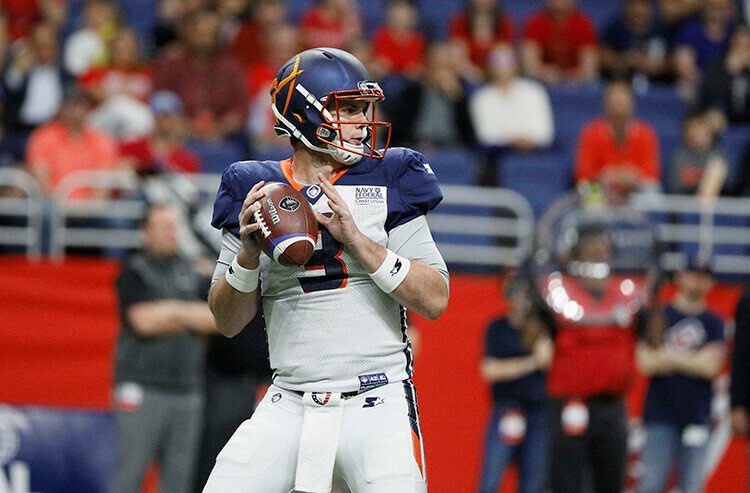 Quarterback Garrett Gilbert and the Orlando Apollos look unstoppable through five weeks of the AAF's first season. We’ve reached the second half of the season in the Alliance of American Football (AAF). Are we finally going to see some offense in this league after the Over went 4-0 last week? Oddsmakers have adjusted the totals slightly with only one total for the week opening in the 30s. We dig into the Week 6 betting odds, trends, leans, and give a best bet. Make it back-to-back best bet winners after the Salt Lake Stallions staged a late rally to cover the +6 spread. The bet wasn’t looking great as they trailed 24-11 with less than five minutes remaining but two quick touchdowns gave them a late lead, which they then squandered. They still covered, however, moving my best bets to 2-2. My leans went 2-2 last week with Orlando covering the -3.5 points and the Memphis-Atlanta game going Over the 38.5-point total. My other two leans were Unders, which, of course, were losers after all four games went Over the total in Week 5. If you were following me on Twitter (@coversBD), I also gave out a winner with Atlanta -1.5, but that won’t count towards my overall record. The Over went 4-0 last week and is now 8-12 on the season. The road team went 3-1 against the spread for the second straight week. Home teams are now 10-10 ATS on the season and 12-8 straight up. Favorites went 3-1 straight up and 2-2 ATS last week. Favorites are now 15-5 straight up and 11-9 ATS on the season. No double-digit favorite has covered the spread yet this season (three occurrences). Memphis: 3-2 ATS, 2-3 O/U. On the road, 1-2 ATS, 1-2 O/U. The one notable trend is that both of Salt Lake’s home games have gone Under the total, but bad weather has played a factor in those games. The forecast for Saturday is sunny with a temperature in the 40s, so the weather shouldn’t affect this one. Zach Mettenberger has made Memphis’ offense respectable as it is averaging 23 points in his two starts after averaging 11.7 in its first three games. The defense has been consistently mediocre, allowing between 20-26 points (average of 22.6) in each of its five games. Salt Lake’s only win came at home in Week 3 over what we thought to be a very good Arizona team. 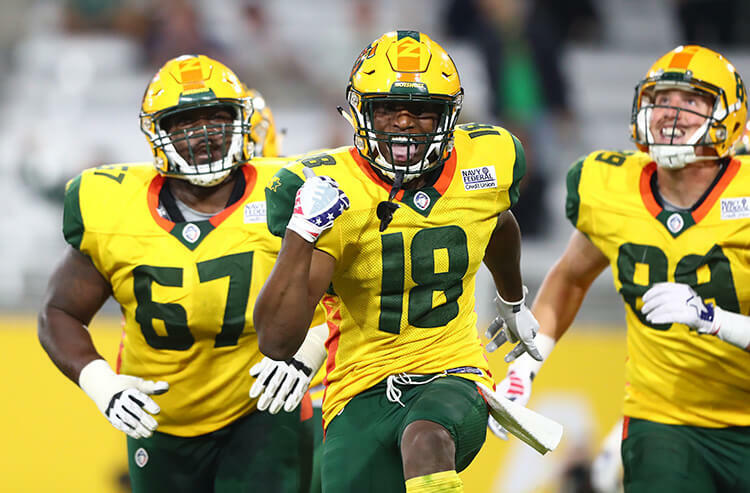 The Hotshots, however, haven’t won since and have gone from looking like one of the AAF’s best teams to one of its worst. Lean: Memphis +8. I had projected this line to be closer to a field goal so I'm happily taking the extra points with the Express. Every game that Memphis has played from Week 2 on has been decided by four points or less. Also, how is a 1-4 team with -22 net points laying eight against anyone? Arizona: 1-4 ATS, 2-3 O/U. On the road, 0-2 ATS, 0-2 O/U. At this point, Orlando looks completely unstoppable. The Apollos have scored the most points in the league (149) and have allowed the second fewest (77) for a whopping +72 margin in net points. They’re coming off a game where they scored 31 against the league’s best defense, with QB Garrett Gilbert throwing for 286 yards and two touchdowns and running back De’Veon Smith running for 119 yards on just 14 carries. Arizona is a complete mess of late after starting the season 2-0 having lost three straight, two of which were at home. The Hotshots did show a little bit of life in the second half last week, outscoring San Antonio 25-3 but that was after they had fallen behind 26-0 in the first half. Lean: Under 43.5. I went back and forth between Orlando -9 and the Under but ultimately settled on the Under for two reasons. First, the Under trends for Arizona road games and Orlando home games. Second, the fact that the Apollos still live in Jacksonville and practice in Georgia — this has to take a toll on them eventually. San Antonio: 3-2 ATS, 2-3 O/U. On the road, 2-1 ATS, 1-2 O/U. Atlanta: 2-3 ATS, 2-3 O/U. At home, 1-1 ATS, 2-0 O/U. San Antonio looked amazing in the first half last week, shutting out Arizona 26-0, but then almost blew it as it was outscored 25-3 in the second. The Commanders now play their fourth game in a row on the road. Aaron Murray has saved the Legends from being the laughingstock of the AAF as he is 2-0 straight up and ATS as the No. 1 quarterback. It’s also important to note that Atlanta is playing much better on offense under offensive coordinator Ken Zampese — he’s the team’s third OC of the young season after Michael Vick quit in the preseason and Rich Bartel left the team just prior to Week 3. Lean: Over 40.5. Atlanta's offense continues to improve each week while the Commanders have given up 25 or more in three of their last four games. Birmingham: 2-3 ATS, 2-3 O/U. On the road, 0-1 ATS, 1-0 O/U. San Diego: 2-3 ATS, 2-3 O/U. At home, 2-1 ATS, 1-2 O/U. 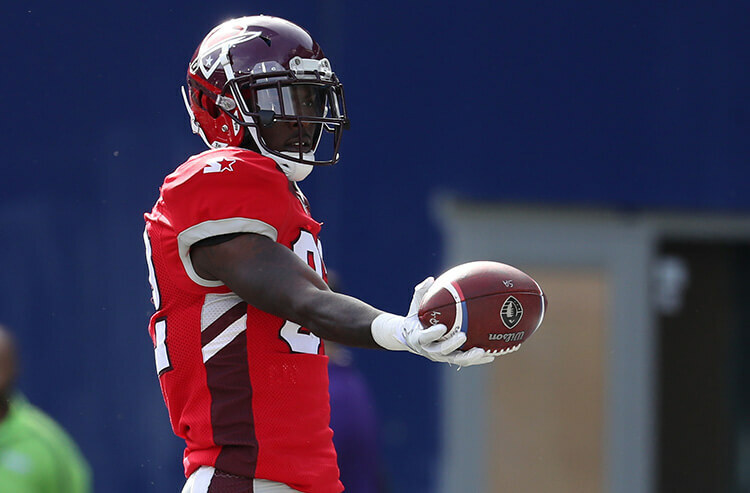 Birmingham became the latest AAF team to make a change at quarterback as it yanked starter Luis Perez in favor of Keith Price late in the first quarter of last week’s loss to Orlando. Price went 18 of 29 for 234 yards and threw the team’s first passing touchdown of the season. The Week 6 starter hasn’t been announced yet but expect Price to get the call. Another key note here is that this is only Birmingham’s second road game — its first was a trip to Atlanta in Week 3. San Diego is undefeated at home and probably should be 3-0 ATS as last week’s almost-collapse was the only time the Fleet haven’t covered the number at home. There were questions as to how San Diego’s offense would respond without Philip Nelson but Mike Bercovici, the Week 1 starter, was serviceable last week, throwing for 304 yards and a touchdown, though he completed under 50 percent of his passes (22 of 43). Lean: San Diego -6. When at home, San Diego is the clear-cut second-best team in the AAF. I'm also just not sold on Birmingham — its only wins have come against Memphis, Salt Lake, and Atlanta when Matt Simms was its QB. 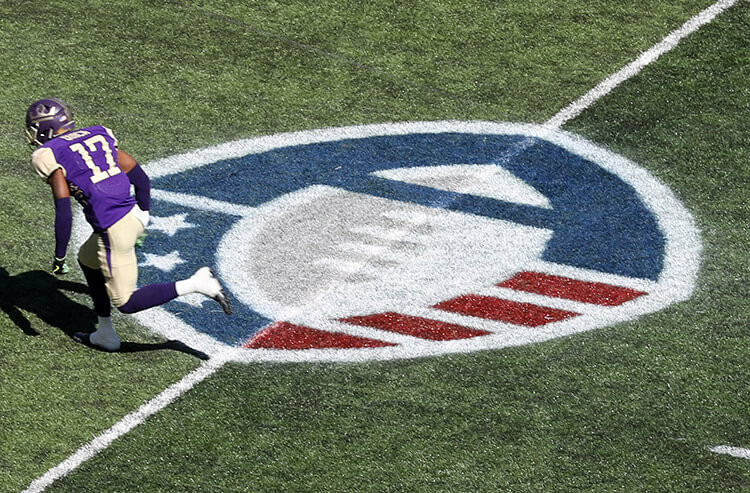 My best bet for Week 6 in the AAF is the Atlanta Legends -1.5 for a couple of reasons. First, this four-game road trip has to eventually take its toll on San Antonio as football teams rarely, if ever, are forced to play four straight away from home. The road may have started taking its toll on the Commanders last week after they almost blew the 26-0 lead they had built in the first half at Arizona. Second, I really think that Atlanta is finally starting to develop some stability and consistency as a team after going through all the coaching and coordinator changes early in the season, plus the switch at quarterback to Aaron Murray. Take the Legends at -1.5 and let's make it three straight best bet winners.